Question: What is the roof pitch? Does the roof in the back extend over the porch? Question: What size is the shower in the master bath? 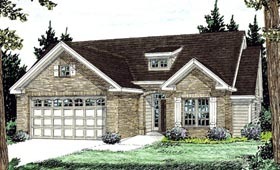 Answer: There is an optional Basement, it is the same size ans square footage as the heated and cooled space above it. Question: The ceiling is described as 12 feet. Is it slanted before it reaches 12 feet? How big is the closet in bedroom #2 Is there enough room for a whirlpool tub in the master bath instead of shower? Answer: The ceiling is 12' flat, no slope. Bedroom #2 closet is 3'-8" wide and 2' deep. Yes, a whirlpool tub (60" x 42") could replace the shower. Question: I am considering using this plan for an "aging in place" application. It looks like it has many of the needed characteristics. How about interior door widths and universal desing concepts? Is the shower entrace flush to the floor? Height of garage doors? Cabinet layout? Lighting plan? ETC? I'd put the house on a slab foundation to enable easy access. Thanks. 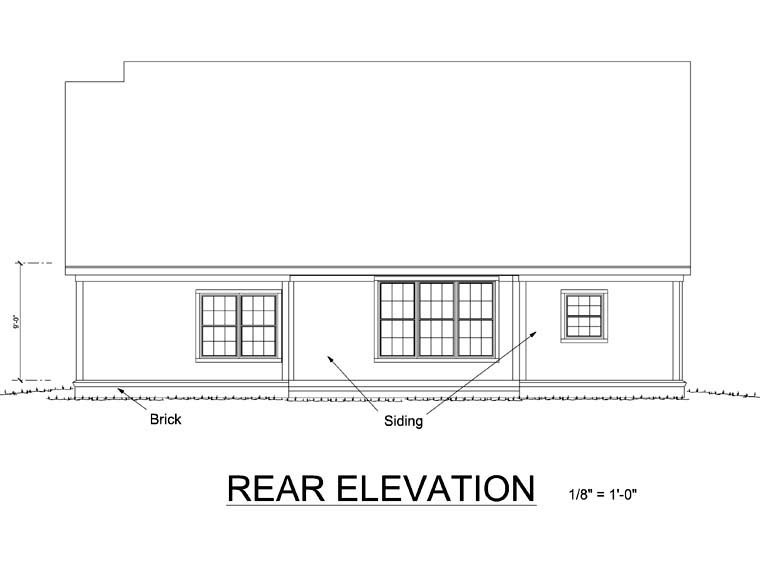 Answer: This is one of my plans that I designed for a Better Homes and Gardens article. It is designed to be fully HC Accessible. Doors are 3 feet wide, halls are 4' wide, Master Bath has a 5 foot turn radius, as designed it meets requirements for future accessibility issues. It also has a list of notes to meet these requirements.